"Do not think I am gone and away. I am everywhere and at every place. I would always be available at your call"
Swamy Samarth was one of the chief incarnations of Dattatreya. 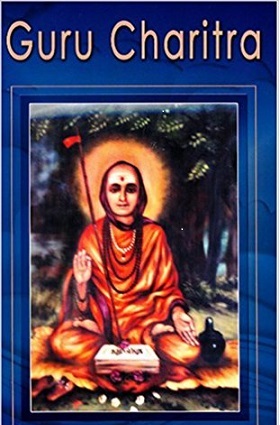 One of the unique features of Dattatreyas is that they appear to the seeker in the form of their Guru or deity they revere and worship, revealing the non-dual nature of all forms or in other words he is the abode of all forms. Sreepada Sreevallabha, Sri Nrusimha Saraswathi and Sri Manikya Prabhu Maharaj have also given their devotees similar experiences. Swamy Samarth lived like an Avadhootha and according to the saying ‘baalonmatta pisachavath' (wandering like a child or a man or a man possessed). The naked Avadhootha, Akkalakot Maharaj or ‘Swamy Samarth' as known and venerated by his devotees, performed many a great leela and inspired the seekers. He lived most of his life at Akkalakot and showed the path of liberation to many seekers by the great power of his yogic energy, completed the mission n of his brief visit and left the body. According to Guru Charitra, Sri Nrusimhasaraswathi left Ganugapur for Srisailam and he finally disappeared in the river Krishna. It is said that after his disappearance he went to Kadaleevanam and after three hundred years he reached ‘Mangala veda' in the year 1838. Since then and until the 1878 when he left his body – the complete history along with details is available. It is curious to note that whenever he was enquired about his origin, he replied, “My origin is Banyan tree and Dattanagaram in my native.” Nobody knows the details of his name or names of his parents, age, caste or creed. He never revealed them to anybody. Now and then he hinted certain things but they were totally unrelated. Once answering to a query of his devotee ‘Chittopant', he said, “My parents belong to madiga community and they tan the skins.” He said, “I came from Kadaleevanam” to another devotee. 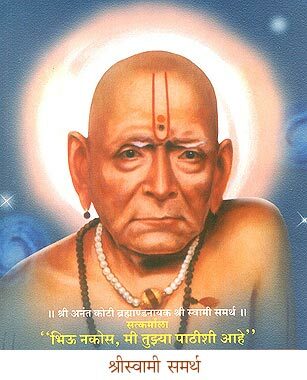 At some other time he said to Karve, a devotee, “I am a Yajurved Brahmin belonging to Kasyapasa gotra. My name is Narasimhabaan, born in Meena rasi. If you once again ask me I will use my sandal.” He said to another devotee “The founder father was a Banyan tree. Origin, the origin of origins.” From all the above we can say that he is the casual factor of all causes, he is the creator or cause of creation, i.e. Dattatreya himself. He meant that he is the Guru of all Gurus. Here the Banyan tree means Lord Datta. The prop roots are the many other was Paramaathma, the cause for everything. He was Datta himself. His behaviors resembling like that of a child or a mad man or a possessed being was a proof that he was Datta himself. His frequent reference to Kadaleevana and telling his name as Narasimhabaan also strengthen this view. Swamy gave darshan in the form of Dattatreya in 1855 while he was sitting beside a pillar at Subbaraya Math near the temple of Datta in Sholapur. The place is venerated even today. In 1856 Swamy came to Akkalkot. The king of Akkalkot Malkjirao Bhonsle and his brother came to him, garlanded and offered pranams. Swamy took out the garland and garlanded the brother of the king, and covered the king with an old upper garment he was wearing. Both of them accepted the honor as a great boon. Afterwards they have become disciples of Swamy. The expenses of Swamy while he stayed at Cholappa's house were complete borne by them. The king had a son by the blessings of Swamy. One day a man by name, Mahath Khan asked Swamy, “Swamy do you smoke?” and placed an empty chillum (a small pipe) in his hand. But to the amazement of all he put it in his mouth, inhaled and lo! There was so much of smoke! When he met Cholappa for the first time he said, “What Chola! Did not you recognize me”. And placed his hand on the head of bewildered Cholappa and he recollected the memories of a previous birth. 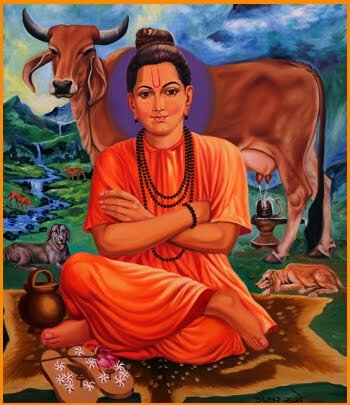 By the grace of Swamy, milk flowed from the udder of a barren cow of Krishnajipanth. Basappa, an oil merchant attended Swamy day in and day out. Angry at this, his wife said, “If he sticks to that Swamy round the clock, what about me and my children?” deeply agitated she rebuked Basappa and criticized Swamy. But did not take any notice. One day he followed Swamy. Swamy warned him not to do so. He did not heed. Swamy made snakes appear on the way. Basappa was not afraid and proceeded. Walking some more distance Swamy said, “Take a snake you like and wrap it in your upper garment.” Basappa followed this instruction. When he returned home and unwrapped it, he found a ball of gold! Basappa's wife understood the greatness of Swamy with incident. She too became an ardent devotee. A rich Brahmin went to Ganugapur. As he had no children he vowed to Narasimhasarswathi that if he begot a son he would feed a thousand Brahmins. But after he was blessed with a son he forgot the vow. He soon died. All the wealth was lost. His wife went to Ganugapur with their son and prayed to Swamy to forgive their wrong doings. That night Datta appeared in her dream and said, “Go to Akkalkot and give alms to an avadhootha staying there. It is equal to feeding a thousand Brahmins.” She came to Akkalkot and had darshan of Swamy who was under a Banyan tree and gave alms to him. Swamy accepted her alms and blessed her, “You accrued the fruits of feeding a thousand Brahmins.” She believed that Swamy was Lord Datta himself and prostrated at his feet. A bachelor went to Ganugapur and vowed to Narasimhasarswathi Swamy, a sweet made of milk, ‘kova' if he was relieved of his stomach pain. Later his pain subsided but he forgot the vow and the pain recurred. Hearing about the Swamy he came to Aakkalkot and submitted his woes. Swamy furiously looked at him and said, “You stupid. How could you forget about milk kova?” he understood his mistake and offered kova to Swamy Samartha, the pain miraculously disappeared in no time. Baalappa a devotee served Swamy. Starting with the cleaning of Swamy spittoon, he gradually did cooking, feeding etc. in a very diligent manner. Soon he became beloved of Swamy. One day Swamy, slapped heavily on the back of Baalappa. Immediately Balappa entered into the state of Samadhi (mystic trance). In fact, before leaving his body Swamy removed his finger ring and put it on the finger of Baalappa, and blessing him said, “This is my royal insignia. I am giving it to you. Take my authority and power and continue the mission without any hurdles.” He took out the Rudraksha mala and put it around the neck of Baalappa. Swamy created sandals out of his mouth and told to consecrate them under the Audumbar tree. Then onwards he became renowned as Baalappa Maharaj. He continued the activities of Swamy even after Niryaana, for thirty-two years and then left his body. He wanted to construct a Math as instructed by Swamy. Lord Hanuman appeared and showed him a suitable site. He consecrated the sandals of Swamy at the site and constructed a Math, which is now known as “Baalappa Math”. A devotee by name Chitthopanth, wanted to perform “Koti Tulasi Archana” (worship with a crore of holy basil leaves) to Lord Vishnu and one day he started the pooja. From the second day onwards Swamy appeared in house when he was about to start the pooja. He offered pooja at the feet of Swamy believing that Datta in the form of Swamy came to his house. On the final day at the end of pooja, Swamy appeared like Lord Dattatreya. His joy was boundless, he fell at the feet of the Swamy and holding them asked, “Swamy, bless me to offer this pooja everyday at your holy feet”. Swamy granted the prayer and disappeared. The impressions of Swamy's feet were clearly formed on the pedestal on which Swamy stood. The same can be seen in the temple of Swamy at Akkalkot. A bachelor, Alounibua along with three others went to Puri on a pilgrimage. All of them fell seriously ill and could not move from their room. They prayed to god. Suddenly Swamy appeared there, looked at them with grace and they recovered. They prostrated before him and asked who he was. Smiling at their query he said, “I am the entire universe. I am omnipresent. But still the places like Sahayadri, Girnar, Kashi, Mathapur, Karaveer, Panchaleswar, Audumbar, Karanja, Narasimhavadi and Ganugapur are the important places of mine.” Swamy clearly declared here that he was none other than Datta. Rich or poor were alike to Swamy. All are the servants of Lord. The king of Akkalkot Sansthan was a devotee of Swamy. One day, on his birthday he along with his troupe of attendants and other royal paraphernalia came for the darshan of Swamy and was about to prostrate before him. Swamy was enraged and slapped him on his cheek. His crown fell at a distance of twenty feet. Swamy then said, “You are a king in your palace and court, your royalty is not needed here. Like kings and others on a chess board I can create any number of kings like you.” The king felt remorse and since then he attended Swamy as a commoner. He was blessed with a son by the grace of Swamy. Baba Sabnis at first was a devotee of Sri Manikya Prabhu. 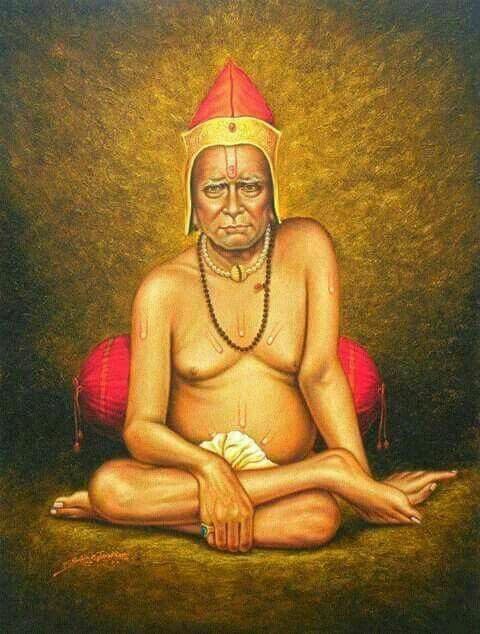 One day Sri Manikya Prabhu showed him Akkalkota Swamy and said, “He is your Guru”. From then he served Swamy with undaunted faith and devotion. The king of Baroda had grown envious about the prosperity and glory of Akkalkot Sansthan. He believed that this was because of the presence of Swamy. He appointed one of his ministers Tatya Saheb to bring Swamy to his kingdom at any cost. Tatya Saheb lured the servants of Swamy with money but could not achieve the task. Then he planned a conspiracy. He requested Swamy to go with him in a palanquin and Swamy agreed. As soon as Swamy entered the palanquin, he closed and locked it and took it to the Railway Station of Kadabgaon where it was opened to get Swamy into the train. But Swamy was not in the palanquin. The king understood that without Swamy's permission nobody could take him anywhere. Many people belonging to different castes and religions were enlightened by the grace of Swamy. 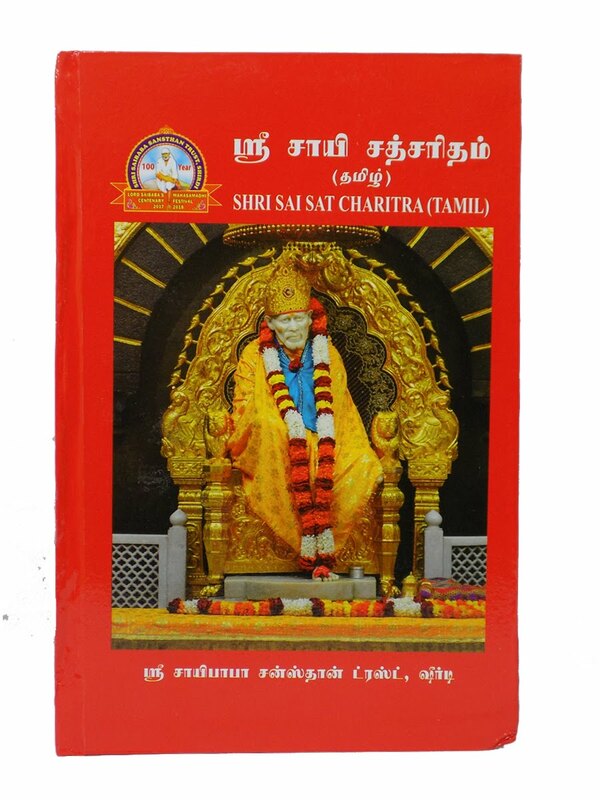 Beedkar Maharaj, Seetaram Maharaj, Yawan Aulia, Ananda Bharati, Anandanadh Maharaj, Tata Maharaj, Rangolee Maharaj, Baalappa Maharaj, Swamy Sutha, Kelkar Maharaj, Kumar Swamy – all these have become yogis with the help of Swamy Samartha. A haughty courtesan, greatly aware of her beauty came to Swamy. Looking at her, Swamy questioned her, “what does a woman have specially in her which is absent in a man? Is there any difference between a man and a woman?” Swamy posed this question so as to teach her that only one essence of a Supreme Being (Paramaatma) is found in all, as “Soul” be it a man or a woman. But she foolishly replied “why not? There is a difference. Woman has beautiful breasts which are absent in men.” Swamy laughed and said, “Do ‘you' have them or ‘your body' has? If you really have them, you should be able to give them to anybody!” the power of discrimination (Vichakshana) arose in her. She offered her obeisance and went away, her head bent in shame. In a few days her breasts, the prime cause of her pride, dried up and chest became like that of a male. Disgusted with profession, she went to Kashi and led rest of her life in prayer and meditation. In 1857 Kodak Photo Company started their branch Bombay. They wanted to begin their business by taking a photograph of Swamy. They came to Akkalkot but Swamy did not allow them. Despite his refusal they took a photograph and the owner triumphantly showed the picture to Swamy. He gave it to one of his devotees and asked him to tell whose photo it was. He saw Lord Rama in that photo but not Swamy. Similarly different people saw different gods like Sankara, Devi, Vithoba, Khandoba in that photo. The photographer got angry and said, “all these people gone mad. This is your photo Swamy! See and tell”, he handed over the photo to Swamy. “I see! Is it my photo! See, see!” swamy again returned the photo to the photographer. He saw the photographer of a monkey! He then understood that it was the leela of Swamy performed to remove his pride. He sought forgiveness. He obediently prayed for the permission, as he wanted to the sacred photograph of Swamy in every house of his devotees and thereby improving his business too. Then, after the permission of Swamy, he took the photographs.Cholappa and his wife Yasobai, devotees of Swamy had the rare fortune of serving Swamy while he resided in their house. Swamy did mischievous deeds endlessly. He on his own fed the cattle with wheat and Bengal gram stored as provisions in the house. He freely distributed many objects in the house to beggars. He used to urinate like a small boy everywhere in the house. He touched and ‘unpolluted clothes'. This annoyed Yasobai who said to Cholappa, “you have brought a mad man in to this house, he will simply such the life out of me”. But she fed Swamy like a mother. One day, a scorpion bit Yasobai and she cried in pain. The neighbors tried different treatments. But her pain did not subside. Swamy sat calmly with his sober glance fixed at an unknown place. Yasobai looked at him, “The whole world says you relieve everybody's pain! What are you staring at when I am suffering like this?” She thought to herself still screaming in pain. Swamy took out one of his sandals immediately, threw it in front of her and said, “Keep your hand in that sandal and the pain will disappear”. She did so. Her pain was gone. After some time when she removed her hand out of the sandal, the pain started again, when she kept her hand inside the sandal, there was no pain. She slept, keeping her hand in the sandal. Swamy made her understand the truth that only we seek refuge in his padukas (sandals) there will be no misery in our lives. This understanding strengthened her devotion and faith in Swamy. One day delighted with the unswerving devotion of the couple, Swamy threw his sandals in front of Cholappa and asked him to worship them. The sandals can still be seen in his house at Akkalkot. Despite such deep devotion Cholappa could not destroy the greed of money in him. Swamy was against Cholappa's taking money from the king of Baroda. Hence Cholappa maintained distance from Swamy and his service. But Cholappa dug a pit and constructed a room for Swamy while he was still alive so that Swamy's Samadhi after he passed would be constructed in his own house.Ibe dat when both of them were about to leave the house,. Swamy said laughing, “Cholappa, you have dug a pit. I will put you first in the pit and then only, my turn will come”. Everybody thought that it was a joke. The people could not realize the truth till the death of Cholappa, who died of cholera after a few days. Swamy like an ordinary human being, sitting beside the corpse of Cholappa, wept at length. “My dear Chola! To whom shall I show my miracles? Where and how shall I move without you?” The sandals, Swamy gave to Cholappa are still in the Cholappa Math. Many are bestowed with rice benefits by worshiping them. Days passed by. Swamy, who cured many dreaded diseases, became ill. The devotees asked, “When will you recover Swamy?” “Do not expect that. I want to go back to my original abode”, was his reply. Kesava Nayak, a devotee said, “Swamy, if you are gone, who would look after us”, his eyes brimming with tears. Swamy gave him his sandals and said, “My incarnation is in Shirdi. Go to the place frequently. 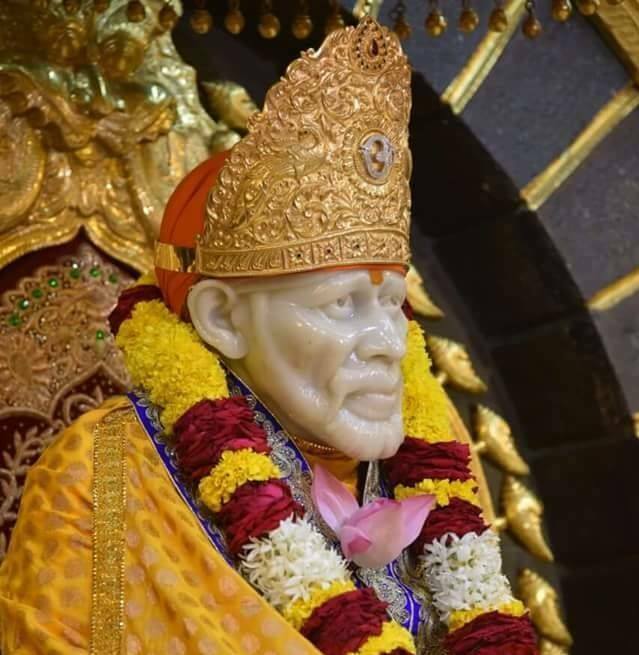 You would not feel my absence.” Later when Kesava Nayak visited Shirdi and went to Baba, Baba immediately recognized him. As Swamy refused to take medicines, the devotees tried to make Swamy swallow tablets forcibly. But he vomited them immediately. The devotees understood that Swamy has already formed a ‘will' to leave his body. A few days before leaving his body, Swamy asked his devotees to do the following bhajan, which he also sang for some time. "Sivahara Sanakara Namami Sankara Siva Sankara Sambho he Girijapathi Bhavani Sankara Sivasankara Sambho"
Swamy sat under the Banyan tree in a padmasan (lotus posture) and said, “I have to unite with this tree. Nobody would weep. Do not think I am gone and away. I am everywhere and at every place. I would always be available at your call.” He then closed his eyes. They never opened again. If one remembers Swamy's answer, when he was asked about his origin, one understands that he returned to his origin – which is the origin, the fundamental source of all thing – the essence of Dattatreya. Into that primary nature of Datta, he disappeared. It was a curious and miraculous thing that he left his physical body among devotees because there was no proof or evidence that he was born from a mother's womb. Swamy was taken in procession to the house of Cholappa and on the thirteenth day of Chaitra in the year 1878, his Samadhi was built. The saga of Akkalkot Maharaj who was renowned as the fourth avatar of Lord Dattatreya in Kaliyuga had been concluded on earth. The three Avataras prior to him namely Sripada Srivallabha, Sri Nrusimhasaraswathi and Manikya Prabhu were predominantly calm and peaceful, but Swamy Samardha appeared fierce, as there was more of “Rudra” in him. He in fact was full of affection and tenderness and was always immersed in pure bliss. Despite his old age, his body never showed any wrinkles. Though he was omniscient, his external behavior appeared childlike. He was a very tall man, his arms reaching his knees. He had a big, pot like belly, which he held while laughing. He had broad shoulders, a whitish complexion, and very broad and thin ears, which shook when he laughed. He had broad forehead and grey eyebrows and his feet were big. He always wore vermillion on his forehead. He wore a lower garment and was adorned with Tulasi around his neck and Kundalas in his ears. Swamy always talked to himself. Sometimes Vedas, slokas and songs were heard from him. He spoke in Marathi and Hindi. He did not differentiate between Hindu and Muslim. He sat both in temples as well as mosques. Many people, who had rich balance of pure karma of previous births, sought his asylum and became perfect beings or yogis. The divine power, which took refuge and expression in his body, had to name or form. We too cannot limit it to a tradition. 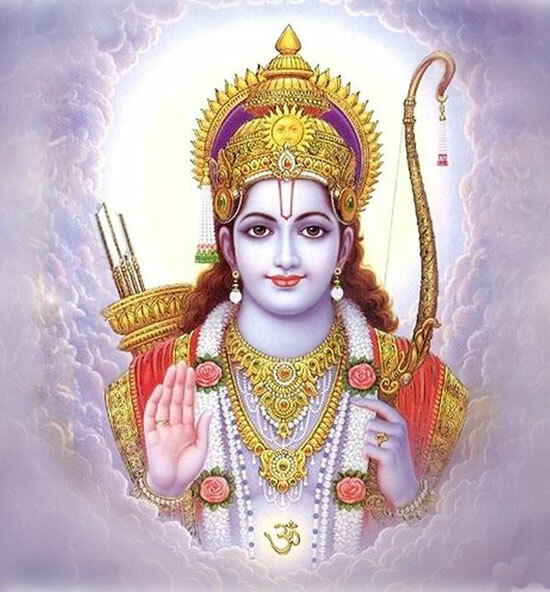 The divine power is nothing but the power of Datta, which was directly connected to the unmanifest Supreme Being. Great men like Swamy Samardha come to the earth very rarely and only for a given purpose. They are above the cycle of births and deaths. It is true that any devotee who approaches with a pure heart can obtain that divine power even today.